A misidentification on the cover of Weinberg Magazine spurs a closer look at the phenomenon of race-memory bias. 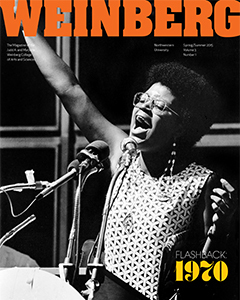 If you saw the most recent issue of Weinberg magazine, you’ll know that our cover story was a retrospective on the protest era at Northwestern, focusing primarily on the student strike of 1970. Eva Jefferson Paterson ’71Many Weinberg College students participated in that action, perhaps none more prominently than Eva Jefferson Paterson ’71﻿ (left). As president of the Associated Student Government, Paterson walked a diplomatic fine line during the protests, working to head off the potential for violence while ensuring that the protesting Northwestern students were able to exercise their right to free speech. When it came time to choose an image for the cover of the magazine, Paterson was an obvious choice. Our magazine designer obtained the cover image from the prominent and reputable photo agency Getty Images. A caption written at the time the photograph was taken in 1970 identified the woman in the image as Paterson. Our designer had no reason to doubt Getty, which supplies images to the world’s top media outlets as well as to Weinberg College. As always, we checked our articles for accuracy and our photo captions against the information supplied by the photographers. But like most publications of our type, we did not share the design and photographs with our sources prior to publishing the magazine. So we were dismayed and embarrassed to learn after we went to press that the woman pictured on the cover was not, in fact, Eva Jefferson Paterson, but another Chicago activist whom Getty representatives are unable to identify. How did this happen? Paterson, who now lives in California, had been interviewed by phone. No one working on the magazine today had met Paterson face to face. Thus, we deferred to the Getty caption, which we had not thought to question — a decision we now deeply regret. A Getty representative acknowledged that the photographer who supplied the image, freelancer Paul Sequeira, had “inadvertently applied an incorrect caption.” A veteran photojournalist, Sequeira covered many high-profile events in Chicago during the protest era, including the 1968 Democratic National Convention and the Black Panthers movement. Reached by phone at his home in California, Sequeira recalled the demonstration at which the photograph was taken. For her part, Paterson has been magnanimous about the error. But she did note that the incident highlights the frequency with which institutions such as the media and the criminal justice system fail to distinguish between members of a minority group. 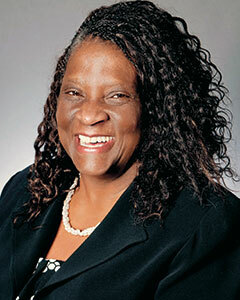 Paterson happens to be well versed in the implications of such misidentification — she is the founder of the Oakland, Calif.-based Equal Justice Society, a national organization devoted to broadening the public’s understanding of race and discrimination. Often her work hits uncomfortably close to home. Just recently, she said, an African-American friend of a colleague had been arrested under suspicion for armed robbery. The phenomenon is familiar to Professor of Psychology Jennifer Richeson, who studies social group membership and cultural diversity. Her research focuses in particular on the ways that race and gender affect how people think, feel and behave. “Unfortunately, this kind of thing is not rare at all,” Richeson said. “There is a lot of research that suggests that it is harder for people to remember the faces of people in a different social group than it is for them to remember the faces in their own group. This is true when it comes to race, age and even socioeconomic status. Richeson cited research by Miami University professor Kurt Hugenberg PhD ’03 and New York University professor Jay Van Bavel that has shown that race-memory bias is reduced and perhaps even eliminated when an individual perceives that those of a different race are members of one’s own team or coalition. “So if I think that a person of a different race is an ally in some way — maybe they share my political views — then I am more likely to remember that person accurately than if I don’t have this coalitional tie,” Richeson said. The converse is not necessarily true, Richeson noted: members of lower-status groups who have to engage with higher-status individuals tend to confuse their counterparts’ faces less often than do the members of dominant groups. “This is why we often see this happening more when images of blacks and other racial minority groups are being examined,” Richeson noted. The findings suggest that people are capable of remembering the faces of members of lower-status groups, but often lack the motivation to do so, she said. As someone who has made it her mission to help society overcome racial biases, Paterson said she welcomes the opportunity to take a closer look at such dynamics. “Not being able to differentiate people from each other is a function of living in a segregated society,” Paterson said. “If you don’t see a lot of black people, or you only see us on TV, you will see us as a blur.